Practitioners are re-inventing the role of spiritual counselor at a moment when the American family is fractured, long-standing institutions are crumbling, the environment is imperiled, racism and hatred are rampant, the nation is divided, and life often feels broken beyond repair. On a sun-drenched Thursday on the penultimate day of June, pedestrians walking past Manhattan’s venerable Jewish Theological Seminary could not possibly guess that within the fortress-like façade a multi-ethnic, multi-faith, multi-generational group — over 100 strong — was banging on djembes, shaking tambourines and homemade maracas, calling out Seneca Indian chants, touching, leaping, dancing, and connecting in ways that recall workshops at places such as the Omega Institute or Kripalu rather than the uber-intellectual ﬂagship institution of Conservative Judaism in America. The event was “The Art of Healing,” a daylong workshop sponsored by JTS’s Center for Pastoral Education in cooperation with UJA-Federation of New York, New York Presbyterian Hospital, and Brooklyn Presbyterian Hospital. Intended for those currently working as chaplains as well as those training for or considering the field, it drew ordained clergy and laypeople alike from diverse allied fields. This edgy, standing-roomonly event is only one recent indication of a notable surge of interest in the chaplaincy as well as a discernible shift in the parameters of the field, which has flowered far beyond its traditional roots. Within the rabbinate and cantorate, the bar has been reset over the past decade to mandate pastoral counseling at leading seminaries. But well beyond the walls of these institutions, Jewish professionals are flocking to a new field called Spiritual Direction, which forms a rubric for the chaplaincy. This burgeoning interest is being tracked by Neshama: Association of Jewish Chaplains (NAJC), the professional organization of Jewish chaplains worldwide and its sole accreditation association. They estimate that there are currently 1200 working Jewish chaplains, though a smaller number are fully accredited. Goldstein asserts that there is a quantifiable increase both in rabbis and cantors who are seeking to professionalize their chaplaincy by gaining Clinical Pastoral Education (CPE) training as well as Jewish laypeople entering the chaplaincy. CPE units are the gold standard of chaplaincy education, now required by many institutions such as hospitals. The practitioners of the New Jewish Chaplaincy are expanding the boundaries of their profession to include birthing rooms and board rooms, homeless shelters and animal shelters. They are trained to deal with sexual abuse, substance abuse, gender confusion, and body dysmorphia. They are re-inventing the role of spiritual counselor at a moment when the American family is fractured, long-standing institutions are crumbling, the environment is imperiled, racism and hatred are rampant, the nation is divided, and life often feels broken beyond repair. The opening of JTS’s pastoral counseling program — and The Chaplaincy School at Los Angeles’s Academy for Jewish Religion (AJRCA) in 2003 — is a significant milestone along the road to the professionalization and proliferation of the chaplaincy. Just this past summer, Hebrew Union College-Jewish Institute of Religion in New York inaugurated Bekhol Levavkha: A Training Program for Jewish Spiritual Directors. Other New York-based seminaries have followed suit. Yeshivat Chovevei Torah mandates pastoral counseling for its rabbinical students for all four years of their study; Yeshivat Maharat (a liberal Orthodox rabbinical seminary for women) offers similar training; and recently, a new graduate program in pastoral counseling was created at Yeshiva University through a joint venture of the Rabbi Isaac Elchanan Theological Seminary (RIETS), its rabbinical school, and YU’s Ferkauf Graduate School of Psychology. The New American Jewish Chaplaincy boom coexists with other spiritual trends where practices such as yoga, meditation, or mindfulness are being integrated into synagogue and communal life. This move signifies a change in the zeitgeist, illuminating an evolving concept of God in an increasingly perilous world, explains Rabbi Anne Brener, a professor of ritual and spiritual development at The Chaplaincy School of AJRCA and the author of Mourning and Mitzvah (Jewish Lights, 2001), a classic Jewish bereavement guide. She attributes part of this shift to the admission of women to the rabbinate, which began in 1972. Brener observes that “the focus on compassion and speaking about our relationship with holiness has exploded” since women became ordained rabbis. Refocusing the discourse within the synagogue has had a snowball effect, she says, impacting all aspects of contemporary Jewish life. “At first the question was: Can we have women on the bima [synagogue podium]? Then, if women are on the bima, should we start ordaining them? And then if we are ordaining them, we need to look at pronouns in our liturgy. Then we realized that neither of those really described God; we realize what He and She to describe God represented was a God created in our image rather than the other way around. And then we began to redefine God and become real God wrestlers. I think the chaplaincy and spiritual direction are ways of struggling with that,” she said. If Sigmund Freud is the father of modern psychology, then Viktor Frankl, founder of logotherapy and author of Man’s Search for Meaning, is the granddaddy of this movement. Many chaplaincy educators — including Brener — quote liberally from his existential philosophy, which emerged from his experiences as a survivor of a concentration camp. The New American Jewish Chaplaincy promotes the ability to incorporate struggle, adversity, and even tragedy into one’s personal growth. “I had cancer a few years ago and I learned a lot,” reveals Brener. “When cancer survivors say ‘cancer didn’t slow me down,’ I say why not?” The wisdom of spiritual direction lies beyond our penchant for “fixing” things, she says, a radical concept in our self-help society. The ability to address the individual and the “human need for relationship” lies at the heart of the New American Jewish Chaplaincy boom, said Rabbi Joseph Potasnik, Executive Vice President of the New York Board of Rabbis and a chaplain of the New York City Fire Department since 1999. 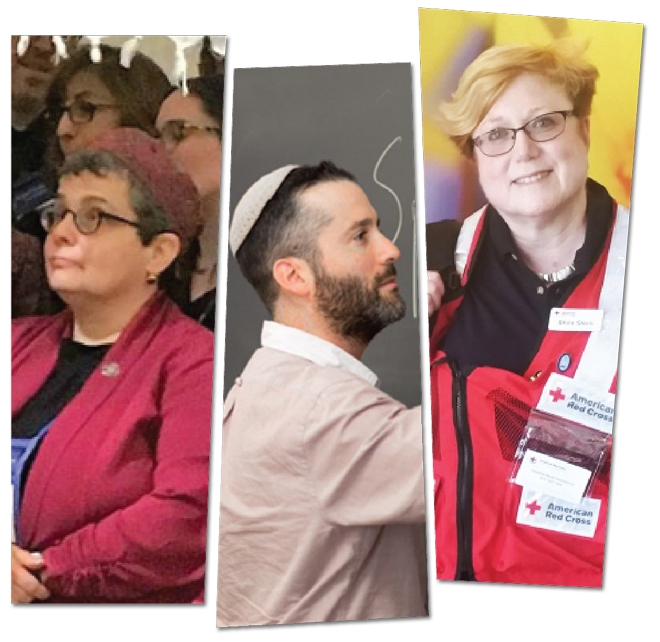 Sixteen years after the first large-scale terrorist attack on United States soil and less than one year into the most tumultuous American presidency in memory, some catalysts for the New American Jewish Chaplaincy boom are easy to identify. Brener quotes the rabbinic teaching about the world being a narrow bridge (gesher tzar). That perception of life as tenuous feels especially apt as of late, she says. Shira Dicker is a New York-based writer, performer, and consultant.